Sometimes, the best way to hook kids on reading is to build on their interests. 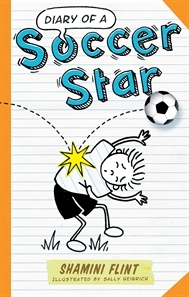 For kids who love their soccer, can I suggest Diary of a Soccer Star? Written by Shamini Flint, illustrated by Sally Heinrich and published by Allen and Unwin, 2012, it's RRP in Australia is $9.99. This chapter book had me in a constant ripple of laughter. Flint knows not only how to write for kids, but how to write in an authentic child's voice. Marcus's wry observations and problems, his terrible luck and his creative solutions will appeal to kids 7- 11 for sure. "But Dad says that writing down my goals will help me achieve them. Yeah right! I scored an own goal with my bottom - does life get any worse than that?" I love the fun of the diary format too. Heinrich's hundreds of delightful little cartoon sketches add such value and even more humour to Diary of a Soccer Star. If you have youngsters who are put off by dense text, this sort of easy-to-read format will make chapter books more achievable for them.